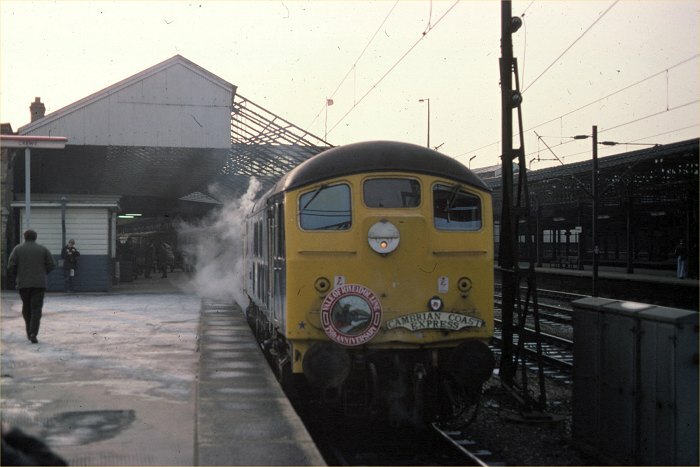 24082 stands at Crewe on the morning of 3rd December 1977 heading (along with 24133) a Wirral Railway Circle excursion to Aberystwyth via Chester. This was to mark the 75th Anniversary of the opening of the Vale of Rheidol Railway, and included a trip along that line. The train is standing in platform 3 - now platform 11 - which at that time was the only bi-directionally worked through platform. Steam leaks from between the locomotives as they try to heat the train. These 24082, 24087 and 24133 were the only Class 24s still in service with working train heating equipment, and were the only ones which appeared on passenger and special workings in the winter months. 22nd December 2002 marks the 100th anniversary of the Vale of Rheidol Railway, now in private ownership. No specials to Aberystwyth appear to be planned.